Convert Outlook emails to PDF, TXT, TIFF, DOC, HTML. There are lots of different ways to convert an email file to PDF or DOC format. However, to automate the process and convert hundreds of emails at a time with 100% accuracy requires a professional solution. Total Outlook Converter is the most reliable, option-filled program that lets you convert Outlook emails to PDF, DOC, HTML, XHTML, TXT, TIFF, JPEG, and EML in batch. The simple solution for archiving Outlook emails as PDF or preparing them for a legal matter. The app will process email attachments as well letting you save them to the same (or a new) folder. Note: if you'd like to convert attachments to the same target format as the message body check out Total Outlook Converter Pro. Add page numbers to your files or stamp bates. Convert emails as well as contacts and calendar. Rename output files with date or sender or subject in the file name. More unique options.. 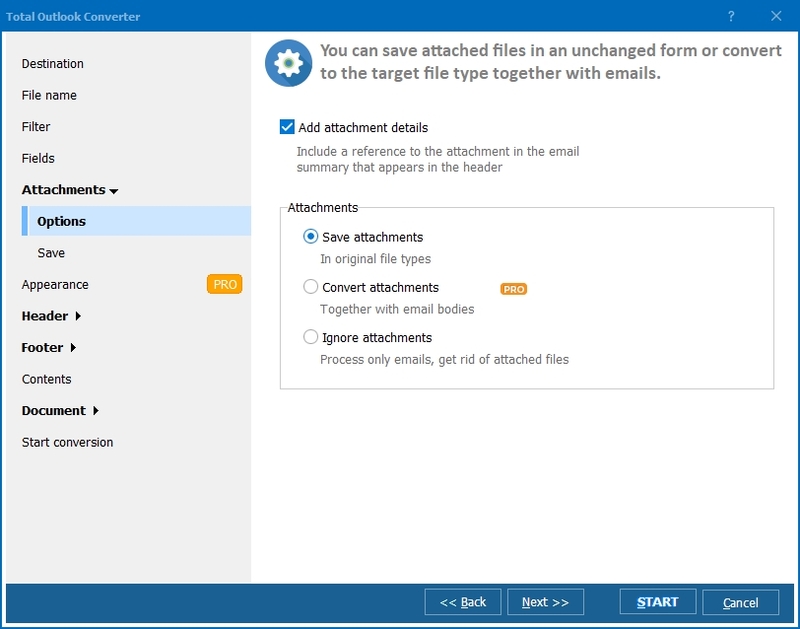 When you use the Total Outlook Converter to archive emails into more shareable formats, you can reference them later without the use of Outlook. The app is perfect for any legal matter, freedom of information requests, back up or migration. 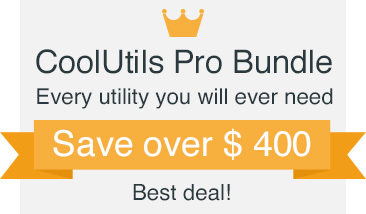 Download your free trial copy now and test it without any obligation (server version with ActiveX is also available). "My wife is delighted to have the CoolUtils Outlook Converter and is very happy to convert bit a bit all of our old and new mails mails into pdf format. From what I understand of the matter she found that she had lost some mails which she had to retrieve through a backup software because the mail provider had deleted messages that were "old". She told me long ago that it would be nice to have a software that would allow batch conversion into an easily readable format. So, on behalf of my wife I say thank you once again." "It does indeed list and convert files, thankfully, and from damaged Outlook sources. It has annoying behaviour, however, such as always launching with a directory tree fully expanded instead of closed." Total Outlook Converter supports both OST and PST files! The app will automatically search for Outlook files on your computer. Total Outlook Converter can also convert calendar (.ics) file! You may convert several emails to TIFF or PDF and combine them all into one multi-page file (TIFF or PDF). Some emails have links to images in the web. Our converter can both download those images and insert them into the file or skip the links to save time and traffic. Check "do not access internet for images" option. Total Outlook Converter supports several TIFF compression modes. You can select the quality and size of the output TIFF images. Attachments can be saved in the original format with a new name (for you to know which file refers to which email). 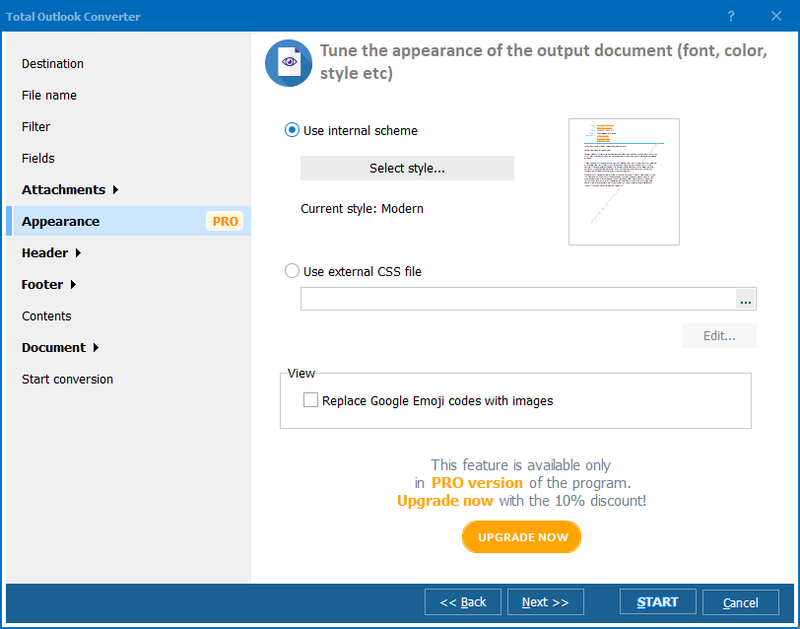 Try the Pro version to convert attachments and embed to PDF. Total Outlook Converter can convert vCard files to DOC, TXT, PDF, TIFF. The widest list of output file types: PDF, DOC, XPS, XLS, HTML, XHTML, TXT, TIFF, JPEG, EML, even MBOX! Save emails to any file type you need. 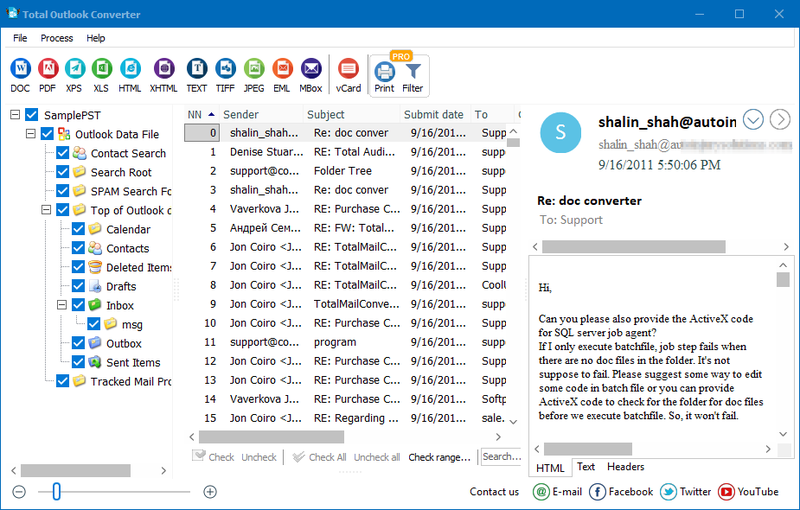 Your contacts from Outlook will also be converted if you like. The well-thoughtout interface has a built-in preview panel. You can preview your emails right in the program. Want to exclude certain fields? 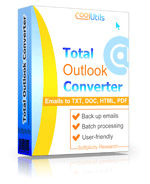 Total Outlook Converter will convert only those parts of emails that you want. For example, you can convert only sender + date fields without body, subject and recipient fields. You can add headers and footers, like date or page number, to the output files. It's great for bates stamping too! Do you have emails from different time zones? To keep files organized Total Outlook Converter can use UTC (Coordinated Universal Time) for all of them. Just tick the boxshot in the wizard. When you convert Outlook to PDF you can make the final file non-searchable. There is also Fast Web View option to make the resulting PDF load faster.